• Fill your base with water. About one inch of water should do it. • Use a small amount of water to moisten the Base Grommet for fitting. • Place your Shaft into the Base and rotate clockwise slowly. • Fasten the Snap-On Tray over the Shaft. • Fasten the Bowl grommet over the Shaft. • Gather your Flavored Tobacco, Tongs, Metal Bowl screen (or foil). • Unpack or loosen the Flavored Tobacco. 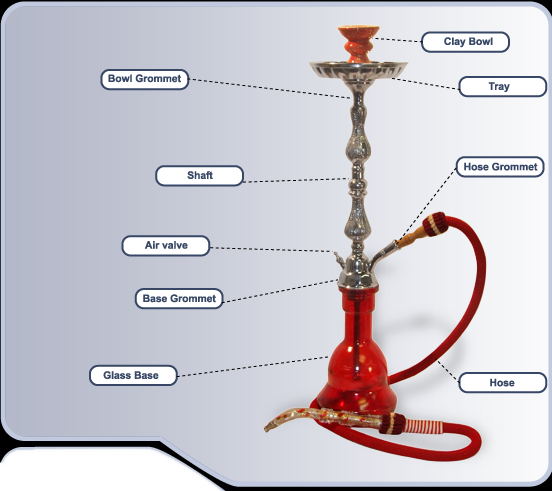 This will make it easier to load into your hookah and will give you a smoother smoke. • Without overfilling the bowl, lightly place your loosened tobacco into the clay bowl..
• Fasten a screen (or foil) over the Bowl. • If you are not using a proper screen and you are using foil, be sure to poke small holes into the Foil. Attach your Bowl to the top of the Shaft, by fastening it onto the Bowl Grommet. • Hold a piece of Charcoal WITH YOUR TONGS, light the charcoal and place it on top of the Metal Bowl Screen (or foil). • Puff on the hookah a few times to wake it up. NOTE ON TOBACCO * The tobacco should never burn. Avoid burning your tobacco by keeping your bowl moist. Keep your bowl moist by using fresh tobacco and by making sure there is adequate water in your base.